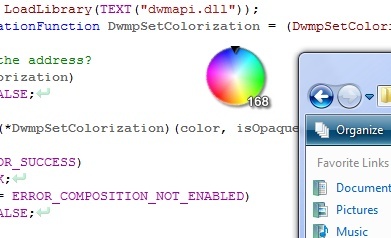 The DXVistaAeroColor plugin is a scripting plugin that exposes Vista Glass color control to scripts. I�ve downloaded your DXVistaAeroColor. I Think it's very interesting to use in my themes. But I have a problem, I can't put that working.What can/should I do? This is a plugin, so you will have to add it to an object and write a script to use it. You can find out more about how to write scripts in the DesktopX documentation. If you don't want to do that, there is a widget that already does the work for you (the one in the screenshot), and you can find it here.